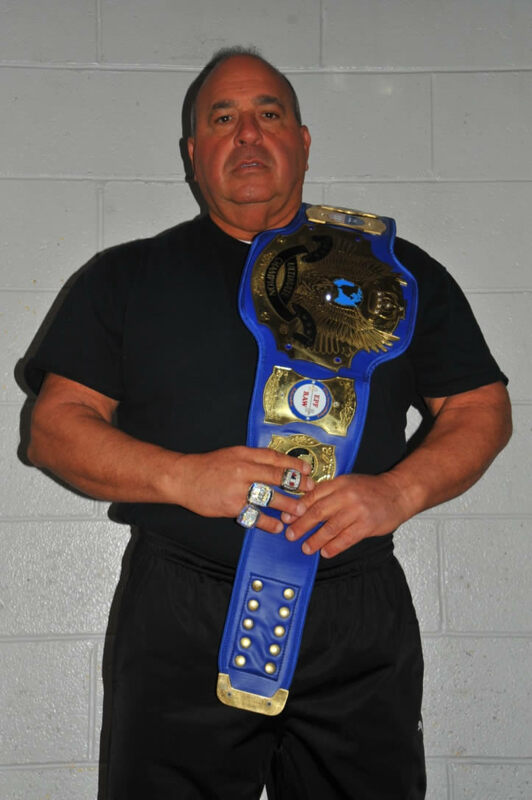 George Lazzareschi Jr., also known as “The Big Dog” walks into Ocean State Gym on a daily basis to train, it’s a second job for him, one he is very passionate about, especially when you have been powerlifting well over 40 years. George is a 5x time world champion, and during his powerlifting career he has competed in over 90 competitions, competing in multiple State, Regional and National competitions. George has won multiple State, Regional and National and World competitions, he has 5 really Big Champion rings to prove it for lifting in some of the biggest shows in the sport of Powerlifting, like the Beast of the East, and the Baddest Bench of the East Coast, featured in powerlifting USA magazine and also in the top 100 Powerlifters holding number one for 10 years in his weight class for the Powerlifting USA magazine, George truly is a legend in the sport of Powerlifting. In addition, George has been Rhode Island State Chairman for the Elite Powerlifting Federation for the last six years conducting the powerlifting competitions at Ocean State gym, in Johnston, RI. Although George had made some amazing accomplishments in the World of Powerlifting, he wanted to do more, give back to children’s charities, so he formed his own organization known as The Dog House Powerlifting Organization for Children’s Charities, with this established organization whenever E.P.F. had a powerlifting competition in RI, George combined his love for the Sport and for children’s charities to raise funds for a child and support their cause. In January 2018, George seized the opportunity to purchase Elite Powerlifting Federation from Bill Durant of New Hampshire, Bill made the decision to sell the Federation due to health reasons. George immediately organized his Board to move forward with his goals. The Big Dog has Big Plans for the Sport and is striving to make the Federation one of the biggest federations in the US and will certainly keep Powerlifting – Rhode Island Strong! He will be aggressively recruiting State chairpersons in every state in the United States. Now that George is the President of Elite Powerlifting Federation, he had to step down as Rhode Island’s State Chairman, and he has proudly handed over his duties of State Chairman to his Son, Sloan Lazzareschi, an avid powerlifter himself who will follow in his father’s footsteps. All of the EPF powerlifting competitions are sanctioned shows usually taking place at Ocean State Gym in Johnston, Rhode Island.Lifters can compete in full power – Squat, Bench & Deadlift, Push Pull – Bench & Deadlift or Bench only, Open to Men & Woman Lifters ages13 to 60 plus and several divisions to include Open, Sub-Masters, Masters, Military, High-School, Fire and Police.